Can you analyze a good sports story when you see one? Most news contains a sports features/stories. Sports features contain a lead and the body. Most sports writers have a love of sports along with a strong knowledge of sports and athletes. Sports features capture the emotions of their readers. A good sports writer helps the reader visualize the event and make them feel like they were almost there. After all, a good sports feature often has a reader reading the feature twice! ❶ Locate 3 news features/stories and list the sources for the editorials. ❷ Identify what the 3 stories are about. ❸ Are the questions who, what, when, where, and how answered? ❹ How does the headline draw your attention to the article? ❺ Does the lead address the most important elements of the event? ❻ Determine if and how you could validate the facts that were conveyed. ❼ How does the writing convey enthusiasm for the event? 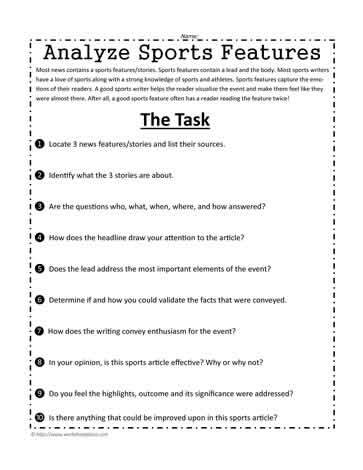 ❽ In your opinion, is this sports article effective? Why or why not? ❾ Do you feel the highlights, outcome and its significance were addressed? ❿ Is there anything that could be improved upon in this sports article?